Nicotine is an ingredient of tobacco and represents a central nervous system stimulant. Therefore, it can be classified as a drug. Nicotine is actually a substance that makes cigarettes addictive. Nicotine addition is very hard to deal with. People who are smokers for a longer period of time may develop different withdrawal symptoms and signs once they chose to quit smoking. Nicotine addition can be defined as physical vulnerability of the body to nicotine. Majority of tobacco products contain nicotine which is easily absorbed. 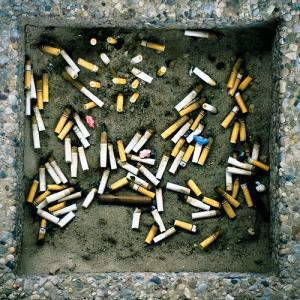 It is estimated that an average cigarette releases approximately 1 mg of nicotine. People who have developed nicotine addition are not aware of such dependence until they decide to quit smoking or using other tobacco products apart from cigarettes or they are forced to stop using tobacco products due to some medical conditions. Under such circumstances the body is no longer supplied with nicotine and withdrawal symptoms and signs develop. A nicotine addict simply cannot stop using nicotine the products (especially cigarettes) and he/she keeps smoking in spite of health complications. Some of the most common withdrawal symptoms and signs include difficulty concentrating, anxiety, irritability, restlessness, headache, drowsiness, stomach problems, diarrhea, constipation etc. Nicotine makes specific changes in the brain (affects brain transmitters) and if one consumes products containing nicotine the addiction soon develops. It is able to stimulate the release dopamine, a neurotransmitter that offers a feeling of pleasure. Since the brain eventually gets used to nicotine the same feeling can be achieved with more nicotine. This also explains cravings felt by people who try to quit smoking. Apart from being a highly addictive substance nicotine is also associated with certain body reactions that can be detrimental for many organs and organ systems. Some of several physiological reactions caused by nicotine are acute increase in heart rate and blood pressure, constriction of blood vessels, changes in brain waves and muscle relaxation. Furthermore, nicotine inhibits the release of insulin from the pancreas and may cause an increased level of sugar in blood. It also stimulates the release of adrenaline. Excessive intake of nicotine can be very dangerous and intoxication symptoms and signs include nausea, vomiting, weakness, abdominal cramps, headache, coughing or gagging. It is also essential to mention some of many detrimental effects of consuming products containing nicotine, particularly cigarettes. These are dry skin, increased incidence of certain cancers (orophagyngeal cancer, lung cancer, laryngeal cancer and esophageal cancer), lung diseases (emphysema and chronic bronchitis,), increased risk of heart conditions, infertility, pregnancy complications etc.